On January 29, 1996, 3D Realms released v1.0 of the shareware episode of Duke Nukem 3D. A legend was born. What most of the public does not know is that the game was several years in the making, and the development started almost immediately (to the day) after the release of Duke Nukem II (December 10, 1993). On January 29, 1997, 3D Realms has decided that for the one year anniversary of Duke Nukem 3D, we'd release a sneak peek into the development of the game. Released now is LAMEDUKE. What's LameDuke? 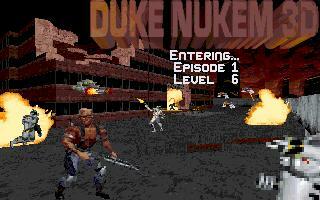 LameDuke is a beta version of Duke Nukem 3D from December 1994. You can download it by clicking on the LameDuke title screen above. PLEASE BE AWARE THAT WE OFFER NO SUPPORT ON THIS. IT IS BEING RELEASED AS-IS, AND FOR ENTERTAINMENT VALUE ONLY. DO NOT SEND US E-MAIL ABOUT LAMEDUKE! Make sure to visit Andre Viens' LameDuke Page. It has more info about the game, including some cheat codes for LameDuke.